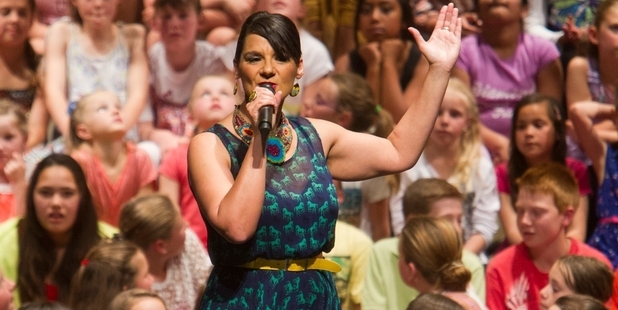 Hundreds of children sang and smiled their way through a songbook of Kiwi classics over three nights in Napier during Kids for Kids. A total of 22 local schools took part in this year's event, titled Everything is Ka Pai and featuring tunes by Dave Dobbyn, Brooke Fraser, Jamie McDell, as well as old favourites like Haere Mai and Poi E.
Mass choir performances at Napier Municipal Theatre were fronted by actress and singer Jackie Clarke, who performed solos with some of the children. Kids for Kids tour manager Dayna Vawdrey said: "We have a narrator doing the Wonky Donkey, it's quite a task to remember all those words. We have a ukulele medley, so there are a lot of different ways for kids to shine." Adding to the entertainment factor were poi performances and break-dancing sessions. The show promoted work carried out by World Vision, with an aim to sponsor 200 children in Africa this year. It was an opportunity to educate Kiwi kids from 5-13 about global citizenship, Ms Vawdrey added. "Jackie sponsors a little girl and she talked about how it has helped her kids to learn about want and need. New Zealand is not perfect, we still have our problems, but it shows them how privileged they are to live here." Hawke's Bay parents turned out in good numbers to show their support on the second to last stop on this year's tour.